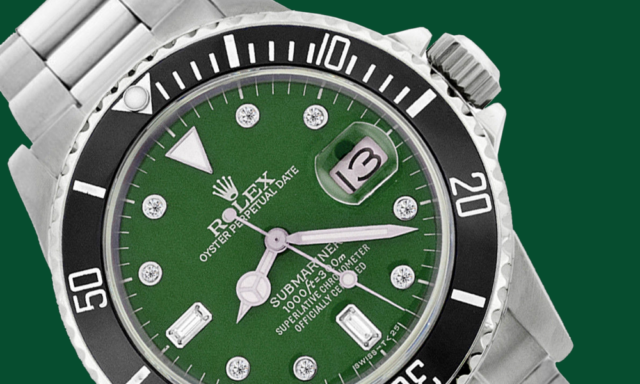 Type: Rolex Ref. 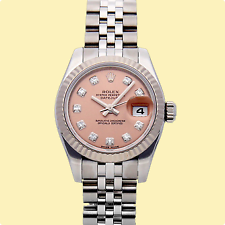 6917/8 Lady's Gold Oyster Perpetual Datejust. Currently for 6.5" wrist. Dial: champagne, gold indexes. Hands; gold baton hands. If the gold content is stamped on the item, we will list the item as the stamped gold karat. Model: Datejust. This is an authentic Rolex watch with a Rolex black dial, and a Rolex 18k white gold fluted bezel, and a custom stainless steel jubilee band. 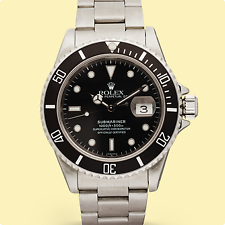 Dial: Rolex Black Dial. 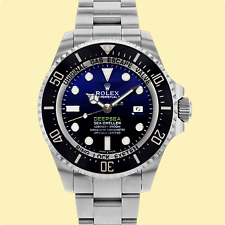 Bezel: Rolex 18K White Gold Fluted Bezel. Case Reference: 7914. Dial: White / Silver HOBNAIL Dial with Raised Steel Markers. Circa: 1950s. Working Condition: No. Will tick over but in need of a service as has been sitting for many years . 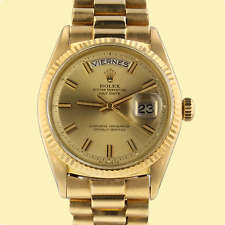 This is a very clean Rolex Ladies Watch, small round face, we do not believe this is a fully original automatic watch, working condition, original face is very clean, NO BOX or papers. Appears to be all original and is running. There is the Model # 1500 and a serial # 3108733 marked between the lugs and this serial number matches the paperwork to the watch. Silver matching hands and a silver center sweeping second hand. 18K GOLDPLATED CASE SIZE Ø 36mm. 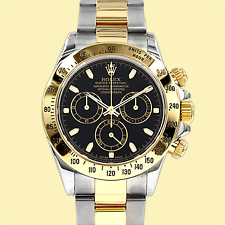 CASE :BEAUTY 18k GOLDPLATED CASE, STAINLESS STEEL BACK SIGNED "ROLEX". SIZE: 36mm. and (42mm. from LUG TO LUG). FROM 1940s. DIAL : CLEAR TONE DIAL (REFINISHED). Made Same Year As Everest Expedition! MANUFACTURER : ROLEX. CROWN :ORIGINAL. SIZE : 36 x 33 MM ( with crown). CASE : Original ,STAINLESS STEEL CASE. CASE BACK : Original, STAINLESS STEEL BACK CASE. AGE : 1960'S. Each item I list is described to the best of my ability. Bought from original owner. The dial is beautiful but the crystal is very scratched. Case could use a good polishing. Reference Number: 1807 on case between lugs, 1803 on case back. 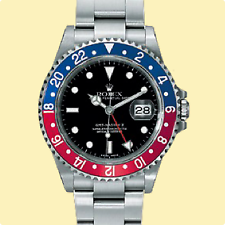 Manufacturer: Rolex. 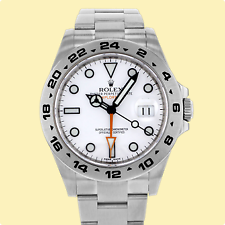 1603 Stainless Steel watch with Stainless Steel Fluted Bezel, Original Silver Dial, Applied Steel Bar Markers, and Original Rolex Stainless Steel Jubilee Bracelet. Strap: Original Rolex Stainless Steel Jubilee Bracelet, produced in Switzerland. Oyster Perpetual. We are here to solve your problems. 80 Years of Experience. Istanbul Market was founded in Istanbul, Grand Bazaar in 1929. History Us. Rolex Air King Date, 5700, 1986 unpolished Full Box and papers. RARE orig Watch! Rolex Air King 5500 in Pristine condition. Just serviced. This dial is original and not refinished. Much of it will be covered when installed in a watch but, not all of it. Dial surface is very good. Both feet are in tact and base plate is stamped Singer. Has a silver dial with a quickset display date window. we can polish upon request for a small fee. We believe it has ever been polished. Quickset Date Yes or No: Yes ;. Manufacturer: Rolex ;. Rolex Instructions. CASE : Original ,GOLDPLATED CASE. MANUFACTURER : ROLEX, SWISS. AGE : 1960'S. Each item I list is described to the best of my ability. The photos are of the actual item being sold and are as detailed as possible. 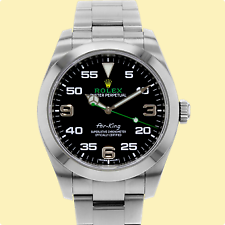 Rolex Date-Just 36mm Two Tone Stainless 16013 Champagne Jubilee Watch. Model DateJust. 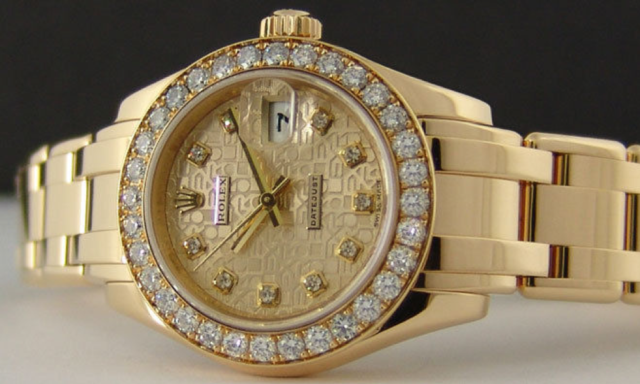 Rolex Champagne Stick Dial with the date at the 3 o'clock. 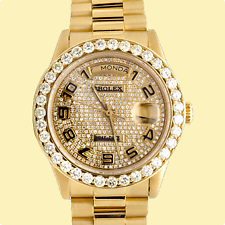 Rolex Fluted Solid 18K Yellow Gold Bezel. Wrist Size This watch will currently comfortably fit a wrist up to 7". RARE 18k Yellow Gold and SS Datejust with 2cts in Si1 VS2 G Diamonds on the 18k Yellow Gold bezel and Dial. Baguette diamond markers at the 6 and 9 O'Clock.really nice piece. The bracelet shows mild to moderate stretch. Reference #: 1625 ;. Manufacturer: Rolex ;. Rolex Instructions. Dial condition : Very good to excellent, a few minor surface scuffs ;. Dial Color : Champagne ;. CASE : Original ,CAPPEDGOLD CASE. 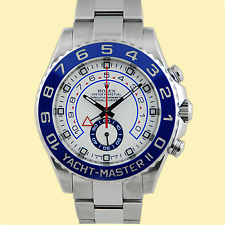 MANUFACTURER : ROLEX,SWISS. BRACELET ; NEW GENUINE LEATHER BAND.FITS 7.2 WRIST, ORIGINAL ROLEX BUCKLE. AGE : 1970'S. Each item I list is described to the best of my ability. Im Happy To Respond. Stainless steel watch with screw down back case & crown,black military style date dial. Swiss made. from lug to lug is 41mm. This is a Used Watch it Show Minor Crystal & Exterior Scratches. Crystal Ref # 25-135 135 for Rolex New "Clark"